﻿ What kind of noises and sounds do raccoons make when they live in your house? Wildlife Removal Advice - What kind of noises and sounds do raccoons make when they live in your house? What kind of noises and sounds do raccoons make when they live in your house? While you want your home to be a location where you can get away from the world, there are many instances where wild animals may find that your house makes the perfect respite for them as well. They love the solitude and peace your house provides just as much as you do, and this may mean that you may find an animal like a raccoon located in your basement or in the attic of your house. The problem in the situation is that most people are completely unaware that this animal has gain access into their property. Because of the loose board, a hole, or crack somewhere, the raccoon is able to figure out how to get in and create its own residence there. Soon it can be using your insulation, old blankets, clothing, or newspapers to make the ideal nest for itself, creating a large number of health risks for you and your family. What becomes the biggest problem for most people is that they are completely unaware that the raccoon has gain access into their home. At least they think they are unaware. A lot of people will tell you after they had the opportunity to pick about it for a little bit that they should've known that a raccoon was there because it was making noises that clearly gave itself away. If you are concerned that a raccoon may have gotten into your home, here are the kind of noises and sounds that raccoons make when they live inside your house. Learn whether or not raccoons can open doors or windows. The first kind you should be paying attention to is a scratching noise. These animals will try to dig it areas along the wall, floor, or other area in the house that is quite distinguishable to you. You should especially here these kinds of noises if the raccoon is in the attic of your home. It will frequently try to scratch at the wall or at the floor, looking for access ways it can create to get into other areas of your house. If the animal is in your attic, you should also hear the clicking noise of its paws as it is walking across your ceiling. This should be another noise they should sound out of the ordinary, especially when you are sleeping at night. Find out: Do raccoons come out in the rain? Consider that raccoons are nocturnal animals, which means that they are asleep during the day and awake at night. Because of this, the noises that they are making should be easily heard because your house should be quiet for the most part. 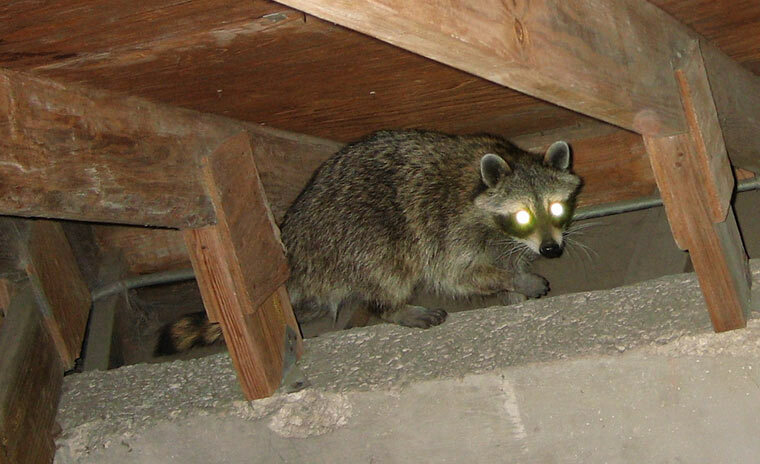 If you start to hear scratching and clawing noises, then it is likely that you have some kind of animal in your attic, and that may be a raccoon. One other noise you want to pay attention to is if you have more than one raccoon in your home, it is not uncommon for the two of them to engage in some kind of wrestling match with one another. You should hear the sounds of this scrum going on.